In my own personal pastry hierarchy one category actually ranks higher than chocolate. Berries. In-season, eyes closed, hands stained, stuff-them-in-your-mouth berries. I’d only punish myself if I tried to rank my faves so I won’t, because dessert is the opposite of punishment. 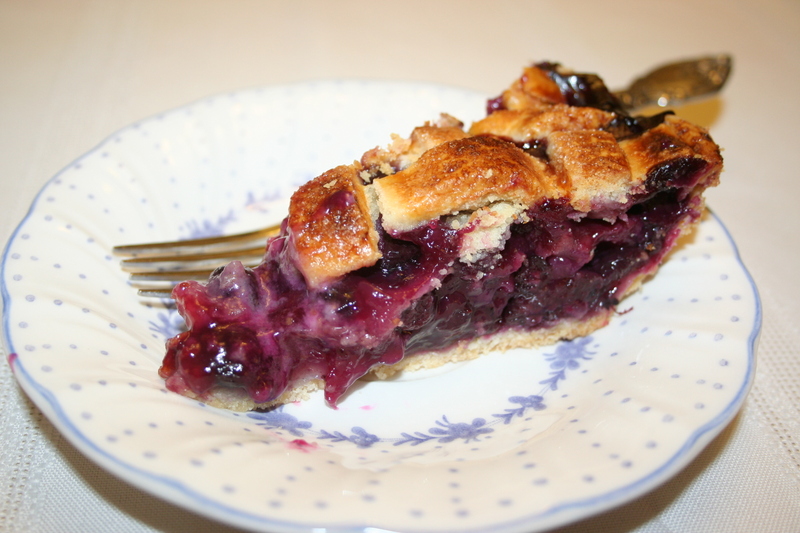 I will say that blueberry pie is one of the grand dames for me, a pie so full of itself in flavor and voluptuousness, that I would fight for the last piece of it. Cold. Right out of the refrigerator. Eaten from the pie plate. Without a fork. I mastered the minor art of pie dough many years ago when Martha told me I could do it. Actually, my grandmother influenced this process at a somewhat earlier time as I stood in the kitchen watching her literally sling pie dough around without fear. A German lady with an unacknowledged French gene, she dominated the Crisco dough as she flipped it into the pie pan, slid in the fruit and sugar and willed it into the oven. The way I knew she was German was that she always gathered the dough scraps and threw them together to make a little pie she called a Dutcher. No one else in her family knew that. Martha held dough court using butter as did Julia before her and, to be honest, her basic pie crust recipe never failed. As a result, my Pie Lady confidence rose like a buoy. Deep dish pies. Jam tarts. I searched out any opportunity to find subtle ways to enhance the single berry flavors I loved. Fast forward to today. A pastry cook’s interests merge with her training and the guidance she receives in the professional world, which then evolves into her style as a chef. Promoting simple, deep flavor in every dessert is a driver for me. So, pies are a simple category of desserts. They actually require little technical skill to do well, and certainly not the skill set a trained pastry cook possesses. Yet, pies represent what fundamentally attracts us to dessert: a satisfying taste and a connection to that which sustains us. Simply, fruit flavors pop when sweetened and when complemented by certain other flavors. Raspberry with almond. Black raspberry with anise. Blueberry with lemon. This is all to say I feel a grounding in the quality of flavors which I wish to communicate to readers and, in the future, guests or customers. Preheat the oven to 400 degrees F. Roll out half the pastry dough into a circle large enough to fit a 2″ deep 11″ tart pan or deep dish glass pie plate. Line and refrigerate. Roll out remaining dough to a thickness of 1/8″ and cut out leave shapes using a sharp knife. Make the veins of the leaves by pressing the back of the knife into the leaf. Transfer to a parchment-lined baking sheet, cover and refrigerate until ready to use. Mix the blueberries and lemon zest in a large mixing bowl and sprinkle with the flour, 1 C sugar and the butter. Gently toss berries to cover. Brush the entire pastry crust (edges and bottom) with the egg glaze and pour the blueberries into the shell. Dot the berries with small butter pieces. Decoratively arrange the leaves on top of the fruit [or roll to lattice-work, if you prefer] , covering it almost completely. Brush the leaves with the egg glaze and sprinkle with 1 Tbsp sugar. 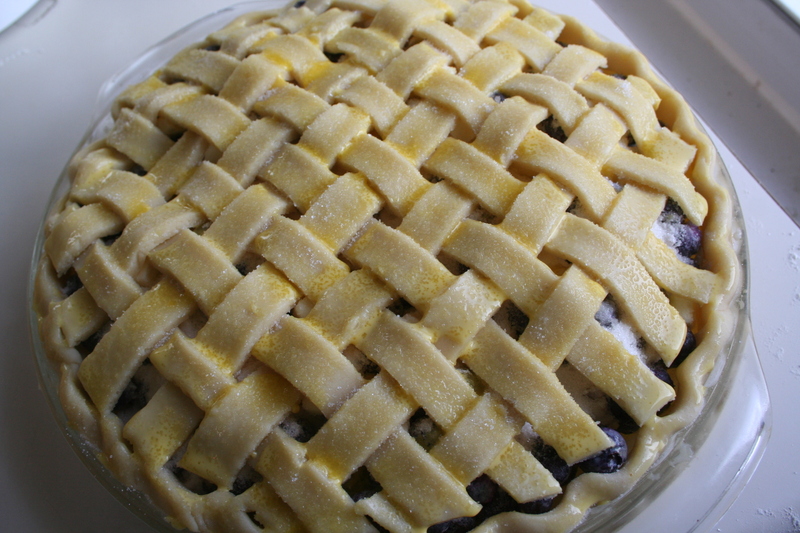 Bake for 50 min or until the blueberry juices have bubbled and thickened in the middle of the pie. Cool completely on a wire rack. Combine flour, salt and sugar in processor. Add butter and process for 10 seconds or until mixture resembles coarse meal. Add ice water a few drops at a time through the feed tube with machine running just until the dough holds together in a ball, about 30 seconds. Turn the dough onto a large sheet of plastic wrap, and press the dough into a flat disk. Chill for an hour before rolling.